The 31.09 metre motor yacht Determination has changed central agencies and is now listed for sale by Mark Osterhaven at Worth Avenue Yachts. Built in GRP by Canadian yard Crescent Custom Yachts to ABS class, Determination was delivered in 1991 as a raised pilothouse model. Accommodation is for six guests in three cabins comprising a master suite and two doubles, all with entertainment centres, Insignia television screens and granite-tiled bathroom facilities. 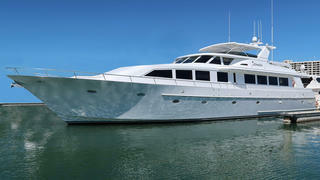 Three further cabins sleep five crew in this yacht for sale. The spacious main saloon features an inviting lounge area for six guests in two oversized armchairs and a matching settee facing a walk-behind wet bar with an ice maker and an entertainment centre including a 52-inch Samsung LCD television screen. Forward is a formal dining area seating eight guests and hosting custom maple cabinetry storing china, glassware and silver. The ‘country kitchen’ style galley has an array of top of the line appliances and a U-shaped raised dinette seating eight guests for casual snacks. Outdoor living comes via the aft deck with a U-shaped built-in settee aft, a high gloss table and four additional chairs fitted with matching cushions and covers, and there is an attractive steel spiral staircase with teak treads up to the flybridge above. The flybridge itself features a helm station, L-shaped seating to port and starboard in front of triangular tables, while al fresco dining and cocktails under the stars are catered for by a stainless steel barbecue grill and a large fridge. Twin 1,080hp Detroit Diesel engines give her a range of 1,000 nautical miles at 13.5 knots. Lying in Fort Lauderdale, Florida, Determination is asking $1,195,000.